Marcella Harasimowicz was born of Polish parents in Chicago on April 5, 1924. She was the youngest child in a family of 10 children. John and Dominica Harasimowicz both came to the United States as young adults. After they married, they lived in Northern Michigan where John worked as an iron ore miner. The older Harasimowicz children were raised in Michigan but Marcella has "Chicago roots." The Felician Sisters taught at Saint Bronislava Grade School. These women influenced Marcella and her religious development. They always encouraged the children to pray. Marcella remembered that her second grade teacher had a special prayer card. When Sister asked who would like to pray for the Poor Souls, the entire class answered affirmatively. The Conventual Franciscan Fathers served at Saint Bronislava Parish. The pastor visited the classrooms frequently. He encouraged the youngsters to learn the Polish language by stressing how important it was for them to speak a second language. After Marcella graduated from grade school, she attended James H. Bowen High School. During high school, she concentrated on business courses. This prepared her for employment in Chicago after completing her high school education in 1942. Marcella worked for a book publishing firm, as a payroll clerk for a construction company that was building a defense plant and in the office at a can manufacturer. In February 1944, one of Marcella’s older sisters entered the Hospital Sisters of St. Francis. Sister Clarette had learned of the Hospital Sisters from Father Leander Conley, OFM while participating in a Gospel study club at St. Peter’s Church in Chicago. Soon Marcella began became a member of the Gospel study club. Someone gave her a vocation prayer card. Marcella incorporated this prayer into the other prayers she recited on the long street car ride to and from work each day. 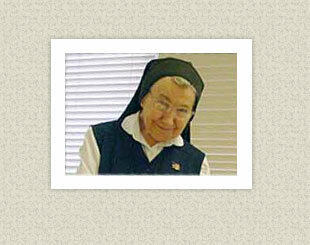 The vocation prayer card inspired Marcella to join the Hospital Sisters of St. Francis in September 1945. When Marcella had completed her postulancy and entered the novitiate, she was given the name Sister Cabrini. She was happy with this name choice for her since Francis Xavier Cabrini was the first naturalized American saint and had Chicago connections like Sister Cabrini. St. Francis Xavier Cabrini was canonized in the year that Sister Cabrini received her name. Following her profession of vows and after obtaining additional education, Sister Cabrini began her life of service as a Hospital Sister of St. Francis. Sister worked in the accounting departments at St. John’s Hospital, Springfield, Illinois, St. Francis Hospital, Washington, Missouri and St. Nicholas Hospital, Sheboygan, Wisconsin. From 1975 until 1999, Sister Cabrini served the Religious Community as Assistant Provincial Treasurer and Provincial Treasurer. While Sister was serving in the role of treasurer, Sister Clarette became ill. She suffered with a long and debilitating illness. For about 15 years, Sister Cabrini assisted with her care. Sister Clarette died in 1996 in the year of her Golden Jubilee of Profession. Sister Cabrini relates that caring for Sister Clarette was a blessing and helped her to realize what her presence meant to the older sisters who are being cared for in the retirement center. At the present time, Sister Cabrini helps with feeding those sisters who cannot help themselves. She spends time with them in a supportive way to help them know that she values their friendship and the blessing that they are to her and to the entire Community. The journey from Chicago to Springfield began with prayer on a streetcar; the final destination of the life journey for Sister Cabrini will be one traveled with service, prayer and dedication.